The history of green roofing goes back thousands of years and is beginning to take off with a vengeance as we look at new and innovative ways to make the world around us more sustainable. 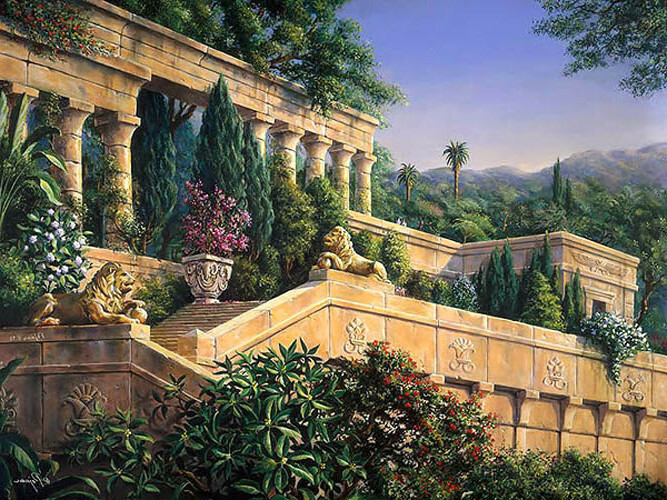 One of the seven wonders of the world, the Hanging Gardens of Babylon, are perhaps the first example of draping our buildings in flora to make them more appealing. Built in what is now Iraq around 500 BC, they were designed by King Nebuchadnezzar II for his wife who missed the green fields and flowers of her homeland. The gardens were grown over stone pillars and roofs which were waterproofed with layers of reeds and tar. In more modern times, people placed sod and grass on their roofs to insulate the interior. The Vikings used it for their buildings and it was a popular way of covering houses in the Middle Ages. If you go to Newfoundland, you can see a reconstruction of a Norse house that would have been typical about a thousand years ago. L’Anse aux Meadows celebrates the first European settlements in the new world of North America.In the 18 and 19th centuries in North America, prairie settlers took green roofing to the extreme when building their homes. Because there was a lack of trees to build cabins, many constructed dwellings out of pure sod, with the ‘bricks’ laid root side up so that they would grow into the one another, creating a more solid foundation. By the early 1900s, Germany was building flat green roofs in urban areas and continued to do so throughout the century. In the 1970s, when the oil crisis was at its height, Germany was one of the first countries to investigate the use of green roofs for energy conservation and by the middle of the noughties there were an estimated 13 million square metres of roofing in the country covered with greenery. In America, New York has made a big push for green roofs in the last few years to help create a better environment and reduce the effects of rain from storm downpours on the city’s infrastructure. The first green roof in New York, however, was actually built on the Rockefellar Centre in the mid-1930s. There’s no doubt that in the historical sense green roofs were created either because of convenience or to create something aesthetic the owner could enjoy. More and more in recent years, we are coming to understand the ecological and energy efficiency properties of constructing something like a green roof in towns and cities across the world. In 1998, after visiting Germany and seeing their green roof developments, the Mayor of Chicago directed municipal funds towards creating them in his own city. Germany has been working to green its technologies for the last 40 years or more, long before it became a necessity for the rest of us. The country now retains a dominant share of the renewables market and a large proportion of its working population are employed within the industry. Most of the guidelines that have been developed for creating and sustaining a green roof have come from Germany and by 2001 43% of cities in the country were providing incentives for installing one on their roofs. Not as popular as in the rest of Europe, the UK was a late comer to embracing the idea of green roofs. Things are now beginning to change and the pace of development is increasing, especially in our cluttered cities where a splash of greenery is welcomed by urban dwellers. Sheffield began a program for creating roof top safaris in 2010, hoping to attract rare wildlife such as the black redstart back to the area. Green roofs have been incorporated in Manchester’s busy Oxford Road district at the Metropolitan University and are designed to reduce urban heat and do their bit to combat climate change. In London, Mayor Boris Johnson has committed to cover 5% of the capital’s roofs by 2030 and work has already begun with constructions at St Jame’s Tube Station and West Ham bus garage. In Cardiff they have installed 270 m² of wild flower turf on the Interpretation Centre near the castle. An even bigger green roof design can be found at the Royal Bank of Scotland in Edinburgh that covers some 1500 m². There’s no doubt that the future of living roofs is beginning to look promising, particularly in our inner cities where there is a need to combat greenhouse gases and provide a more aesthetic and sustainable environment for the local population. In a new initiative in Barking in the UK, they are planning a redevelopment of the East London suburb which will include 40% of the buildings having green roofs. Not only are they eco-friendly, there is a growing recognition that green roofs are making buildings very energy efficient, keeping them warmer in winter and cooler in the summer. Find out more about the ecological and financial benefits of green roofing.